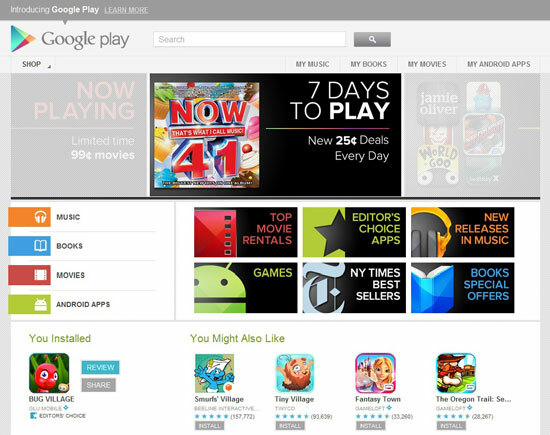 Google is rebranding its app store from Android Market to Google Play. It sounds more, playful, yes, though I would have much preferred it to stick to Android Market. There isn't much change to the new interface and design tweak as the content of apps and services remain unchanged. The point of the redesign is to make it easier for users to discover new apps. Android Market is eclipsed by Apple's iTunes in app volume. Apple themselves have already had more than 25 billion apps downloaded since 2008. Android Market only has 13 billion. That's a huge difference. Google Play Store is probably in the right direction to align the brand with the big G word in the first place. On the left side you can find sections for music, books, movies and Android apps. The entire UI is also much friendlier to use too.